"You are here for the bike show? You are the forth one in a row." That was my greeting from the first of many taxi drivers who drove me back and forth along the strip over the past 2 days in Las Vegas, Nevada. This week Las Vegas was home to Interbike, a number of other conventions, prize fights, shows, shops, casinos, and a lot of tourists walking in and out, up and down. All day, and night, long. Interbike consisted of the Outdoor Demo days (September 12-13), which I did not attend, and the Indoor Expo days (September 14-16), which I did attend for 2 of the 3 days. On Wednesday night Cross Vegas also took place, west of the downtown strip, at the Desert Breeze Soccer complex under the bright lights that lit the night from 6:30-10:30pm. To be at Interbike is fun, interesting, and exhausting. Gear and people fill the convention space where all products are mashed in together. Row after row of booths and exhibition space. Walk down one of the many aisles and you might see bike components next to clothing next to helmets, followed by shoes, more clothing, bikes, tires, power meters, tools, and anything else you can imagine applying to bicycles. Then turn around and go down the next aisle. Interbike is aisle after aisle of bike stuff. Together with this mash of equipment is a mash of languages overheard. It is exciting to hear Italian, German, Spanish, French, English, Japanese all spoken with the same enthusiasm over a bike. Adding contrast is the selling style and appearance of the booths at the Sands Expo Center. 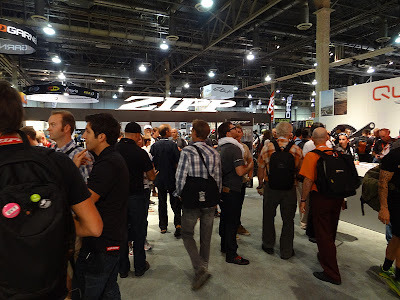 Some exhibit booths were packed with people, most notably the SRAM/Zipp/RockShox booth. Their space was enormous and it needed to be. 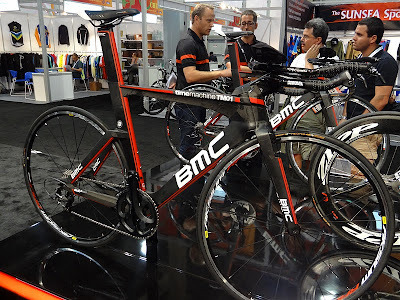 Also popular with constant flow of traffic were the BMC bicycles booth, Look bikes and components, and Specialized. I was lucky to have the resources at the Media Center for use, coffee, water, free lunch, desktops and printers, wifi connect, tables and chairs. On the first morning, in the Media Center, I met a very nice gentleman from Germany named Ralph. Ralph explained that Eurobike, located in Friedrichshafen, Germany, every year, is ten times the size of Interbike. He was here to cover the event, had rented a convertible and was planning to drive out to California after the event. I had a great time asking specific questions as I roamed the show room floor area. I would enter a booth, greet an exhibitor and ask, "if you had a customer who planned to travel to the Pyrenees to ride the CentColsChallenge, what wheel would you recommend?" At the next booth I might ask, "I plan to ride out and watch a stage of the Tour de France on a mountain pass in France, it might rain, it might be cold, and I will need to ride back down the mountain after, which rain jacket would I carry in a jersey pocket that will keep me dry?" At the BMC booth I asked about the versatility of adjusting the stem of their time trial bike. I would often ask about the Pro Teams they might be sponsoring for 2012 and ask to see the high end pro level equipment, or how the riders decide which frame they will ride in which race. The personnel at the Fizik booth were extremely friendly and knowledgeable. So too were the entire team at Albabici's enormous (Italia) exhibit space. I found a few key products that I will be featuring in coming posts. Product recommendations that I think you might be interested in as road cyclists. Plus a few topics to expand your fan knowledge. 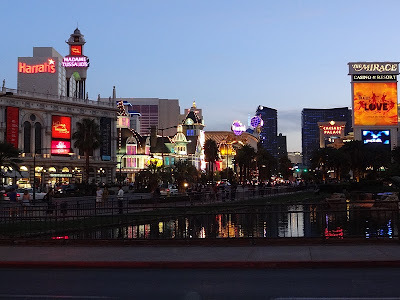 Attending Interbike grew both my picture library and my curiosity. For now my three highlights of the trip were being out at Cross Vegas at the top of the 180 degree uphill turn on the course where fans were holding out 1 dollar bills, and cups of beer. As the riders passed lap after lap, the fans would cheer loudly if any racer collected from the fans along the rope line. Even the famous visiting Cyclocross announcer from Belgium, was laughing at the tradition. "I can't believe the money grabbing," he said. It was a blast to be at the race. Next was stepping out of one booth at the Indoor Expo, to look over and notice Dave Zabriskie sitting 4 feet away at his own DZ Nuts booth. He had just sat down to sign posters. I approached him and asked, "can you sign it to Pedal Dancer?" "Oh, that's nice" he said in his slow drawl. He then had some fun spelling it on my poster and smiled so charmingly, it was memorable. My next story (of many), is that of seeing George Hincapie, at his Hincapie booth, just before I departed Interbike. If you have read my blog, you might remember that George Hincapie was my inspiration for getting into road cycling 10 years ago when I saw him in Pau, France at a stage start of the Tour de France. 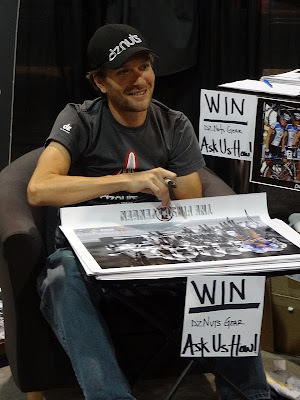 I then met him again at my first Interbike in Las Vegas in 2003 at the Sinclair Party (a tradition at the event). Since those dates, I have seen George all over the world. I have never introduced myself, because in a way, I like him in hero status. Besides the point is this, you never know who you will inspire and for how long that inspiration will grow, but one thing is for certain, I am grateful and seeing George as the finale to Interbike, seemed perfectly fitting. More pictures to coming soon that will give you a visual sense of being at Interbike, with product highlights. I met and spoke with the authors of these excellent websites/blogs BikeRumors.com , Cruiser Revolution , AlbaBici blog and CrossBikeReview.com - please visit their sites!